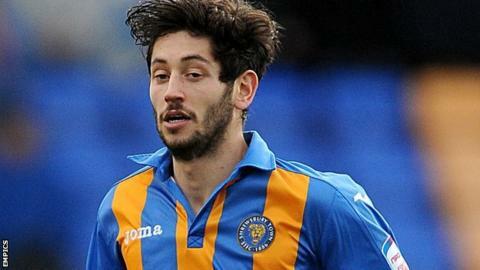 Shrewsbury Town skipper Joe Jacobson netted an impressive free-kick to earn victory against his former club Oldham. Jacobson's goal came on 49 minutes when he whipped a 20-yard effort over the Latics wall and high into the net. Goalkeeper Chris Weale kept the visitors at bay with sharp saves from Jose Baxter and Kirk Millar. Winger Jon Taylor went close to doubling Shrewsbury's lead but he fired against the near post after rounding Alex Cisak. Both clubs guaranteed League One survival last weekend. Town's victory - only their eighth home win of the season - leapfrogged them above Oldham to 18th, ending a three-match winning streak for Lee Johnson's side. "It was a cracking goal from Joe Jacobson. It usually finishes out the ground when he takes a free-kick. "He has risen to his role as captain and put in two tremendous performances, as well as the goal. That might have just given him that bit of responsibility as the skipper of the team. "We had a very good second half and we should have added to the total and put it out of sight before there was any anxiety late on. "We showed a lot of energy for this stage of the season. Oldham came here and worked very hard and we had to match that but, in the end, we played some good, pacy stuff."